Invisalign are the market leaders in dental aligners which are alternatives to regular dental braces and are used to bring teeth movement so that we can bring about Orthodontic correction. What to Expect at your Invisalign treatment in Delhi? The dentist makes a set of molds/Scan of the teeth (intraoral scan using Itero scanner ) and regular diagnostic records (Photos+ X-rays) which are sent to the Invisalign Company in the U.S. The company Invisalign then sends the doctor a digitized treatment plan for the case using proprietary software called Clincheck. This is followed by a review of the clinic check treatment plan by Dr. Anupam Sinha in conjunction with the patient. After the doctor and the patient both approve of the plan, the plan gets approved and the aligners go into production. 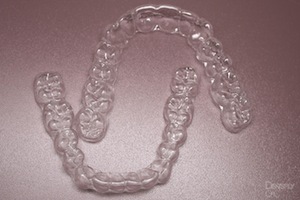 Using the scans a set of sequential aligners are made. These may range from 10 sets to 40 sets. This depends upon the complexity of the case. Usually, it takes about 4 weeks for the aligners to be shipped back to our Invisalign clinic at New Delhi. The patient is provided with these Invisalign aligners in Delhi the beginning of treatment. These aligners are numbered so that they don’t get mixed up. Each set of aligners is worn for a period of two weeks. Once you finish wearing one set of aligners you move on to the next set. With the newer generation Invisalign treatment, most of the cases within the purview of orthodontic correction can be achieved. The job of the Invisalign Specialist Orthodontist is to review your case and give a realistic treatment plan for your case. The team from Invisalign can then covert the plan into a treatment modality that tracks well. At Orion Orthodontic & Dental Care Centre, Greater Kailash 1, our Orthodontist Dr. Anupam Sinha takes care of all the Invisalign cases himself. Invisalign treatment in Delhi is recommended for a patient who is conscious of wearing dental braces due to their occupation or has an active social life which does not allow them to wear conventional braces. These Invisalign aligners can be removed for a short period for social functions etc and are quite inconspicuous even when in use. In our experience, patients are very comfortable as they offer an option of having Invisible braces, option whereas still bringing about the movement of teeth to get the desired results. Book an appointment for Invisalign Treatment in Delhi at Orion Ortho Dental Care.